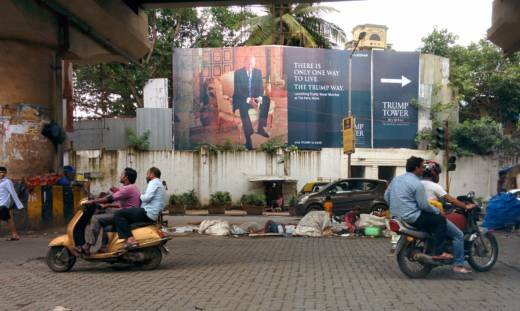 A billboard above a homeless encampment in Mumbai, India advertises a new Trump Tower development. Taken by Paul Needham in 2014, the photo was shared extensively on social media during the 2016 election. The fact-checking site Snopes initially claimed that the image was fabricated, but later recanted after receiving additional evidence proving its authenticity. The map below shows many (but not all) of President Trump's business ventures around the world that could create potential conflicts of interest. The information is based directly on data gathered by Bloomberg in their excellent investigation tracking Trump's "web of conflicts." Click on each property or highlighted country for more on the specific business ties and problems they could present. Where there are several properties in close proximity (as with New York and Washington, D.C.), it may be nexessary to zoom in on that region to see each one. Source: Bloomberg Politics; "Tracking Trump's Web of Conflicts"
As a real estate tycoon, President Trump amassed a huge fortune by slapping his name on a multitude of hotels, condominiums and golf courses scattered across five continents. Trump's vast international business ties -- which include joint investments, licensing agreements and large outstanding debts -- have the potential to create serious conflicts of interest if they in any way influence the decisions he makes as president, especially in his dealings with foreign governments. Although Trump officially stepped down from his role as the head of his company, he's refused to fall in line with his predecessors and divest from his signature properties and brands. Instead, Trump announced at a Jan. 11 news conference that he would hand over management to his two sons and his chief financial officer, giving them "complete and total" control, insisting that "they’re not going to discuss it with me." He also said he would take a series of steps to avoid potential ethical conflicts, such as terminating all pending deals and not entering into any new international agreements. But a growing number of government watchdogs, including the head of the Office of Government Ethics, insist that this loose arrangement raises serious ethical concerns. Trump’s plan is “meaningless from a conflicts-of-interest perspective,” OGE director Walter Shaub said in January. "Nothing short of divestiture will resolve these conflicts." Shaub noted that all presidents since Jimmy Carter in 1978 had either established a blind trust run by independent trustees or invested only in non-conflicting assets, such diversified mutual funds. Trump counters that he's not required to do any of this, arguing that presidents are not subject to the same financial rules as members of Congress or even members of their own Cabinet. This claim is technically true. The president and vice president are exempt from conflict-of-interest provisions that apply to other federal employees. “The law’s totally on my side, meaning, the president can’t have a conflict of interest," he told the New York Times shortly after his election victory in November. Some legal experts, however, argue that the loose business arrangement he's set up with his sons could very well create a situation that violates the "Emoluments Clause" of the Constitution, which bars U.S. officials from receiving gifts from foreign governments. The extent of this provision is debatable, but it could potentially apply if, for instance, foreign officials paid to stay at his hotels. This New York Times graphic illustrates what some of these potential conflicts would look like. Trump has also refused to release his tax returns, breaking decades-old presidential protocol dating back to Richard Nixon. The lack of transparency leaves many questions about how much money he actually has, what he owes and who he owes it to. Most of what is known about Trump's finances comes from the financial disclosure form that all presidential candidates are required to file. But that reveals far less information than his tax returns would. On March 14, MSNBC's Rachel Maddow detailed -- with great fanfare -- two pages of Trump's 2005 returns that had been leaked anonymously. But while the limited documentation did show that Trump had indeed paid income taxes that year, they revealed little else of much significance.